The following salad preparation is a complete meal in itself. Toss in some crunchy veggies with cooked chicken chunks and flavor it with select ingredients. It's that easy! 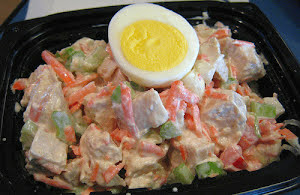 This salad can also be made with firm white meat fish fillet chunks instead of chicken. Feel free to add few extra fruit options and accordingly adjust the quantity of other additions. The leftovers of this salad can be easily stuffed in morning sandwiches. Those who love extra fire on the taste buds can add chili flakes or paprika to the base seasoning. If your main course already include chicken, I'll suggest omitting serving of this salad. To elevate its flavor, add local dried herbs. Let's make this tasty chicken salad in a few easy steps. Do make this nutritious, easy-to-make, and scrumptious salad recipe consisting of boneless chicken chunks with red bell pepper, red grapes, and cucumber. Cook chicken chunks in boiling water on a medium flame for about 6 to 8 minutes. Depending on the size of chunks, adjust the cooking time. Drain and keep aside. Cut boiled egg in halves and keep aside. Take a large bowl and add mayonnaise, lemon juice, Greek yogurt, ground black pepper, and kosher salt. Whip briskly for a minute to combine all the ingredients. Add bell pepper julienne, chopped cucumber, and chopped red grapes to the bowl. Add cooked chicken chunks to the bowl and once again combine everything with a spatula. Make sure the mayonnaise base is coated well on the chicken chunks. Garnish with halved boiled egg and serve immediately.